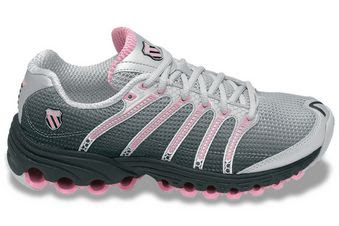 These are the latest running shoe from K-Swiss named Tubes Run 100. It's a lightweight running shoe. • Durability is achieved with a full length Aosta® II rubber outsole. • Flexibility is enhanced by anatomically correct flex-grooves. • Breathability is increased with a mesh upper. • Cushioning is provided by k-EVA midsole compound and the dynamic motion of the tubes working in harmony with the motion of the foot. Go to www.kswiss.com or here for more information. Do you like K-Swiss? Do you prefer another brand? Let me know!